As the upcoming Thomson-East Coast Line launches in 2019, savvy investors can start scoping out hot deals around the most popular MRT stations on the island. Based on the volume of searches amongst property buyers who used our search by MRT station tool on EdgeProp.sg, we have identified the top 5 MRT stations to live near in Singapore. They are (in descending order): Serangoon, Bishan, MacPherson, Buona Vista and Paya Lebar. Interestingly, all five MRT stations are located on the Circle Line and intersect with other major lines, such as the East-West Line or North-East Line. Besides identifying the most popular MRT stations, we’ll also have a look at the most affordable condos located within 500m from these MRT stations. To identify these properties, we looked at completed projects and used average psf figures to come up with the most affordable properties. Located along Vaughan Road and 295m from Serangoon MRT station, the 99-year leasehold condominium was completed in 2003 with a total of 475 units. It is near amenities such as NEX Shopping Mall, Upper Serangoon Shopping Centre and established schools such as St. Gabriel’s Primary School, Maris Stella High and Zhonghua Secondary School and Nanyang Junior College. Located along Upper Serangoon Road and 494m from Serangoon MRT station, the freehold condominium secured TOP in 2016 with a total of 36 residential units. 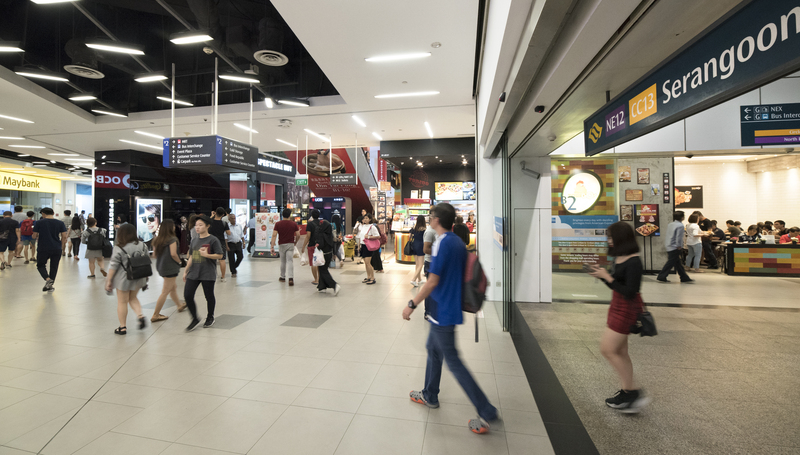 NEX Shopping Mall and Woodleigh Village Hawker Centre are a short walking distance away and the condo is near St. Gabriel’s Secondary School and Yangzheng Primary School. Located along Lew Lian Vale in District 19 and 465m from Serangoon MRT station, the freehold condominium was completed in 2017 with a total of 171 units. It is walking distance from NEX Shopping Mall, Woodleigh Village Hawker Centre and schools such as St. Gabriel’s Secondary School and Maris Stella High School.